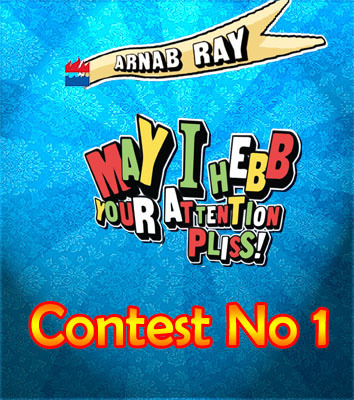 Here is the first contest for “May I Hebb Your Attention Pliss”. 1. On your blog, provide a link to this page. (https://greatbong.net/book). Embedding the above picture in your blog would be nice but not needed. 2. Then write down your top 10 Hindi movie lines or top 10 English movie lines (You can do both if you want. Only one set is required for the contest). If you cannot think of top 10, make it top 5. Cannot think of even 5? Make it top 3. No problem. Only restriction: no two lines from same movie. This done to make it fair for other movies so that they dont get swamped by Gunda or Loha or Sholay. 3. Tag five friends to do the same. 4. Come over to the comment-space of this post and post your blog’s link so I can go and read it. Remember: Before starting the tag, paste points 1 and 4 on your blog so that the rules are available to anyone who wishes to pick the tag up from your blog. Prizes: Two prizes will be given. One prize will be the post I like the most. The other prize will be a random drawing among everyone who picks up the tag. Note a blog entry will be considered valid only if a link to https://greatbong.net/book is provided AND 5 people are tagged [They do not need to pick the tag up for your entry to count though], a “comments-in-RTDM” entry will be considered valid only if the link is tweeted with #MIHYAP tag or posted as status message on FB that I can see. And what’s the prize? No it is not an iPod, iPad or [insert fictitious prize item here]. Prizes will consist of a copy of my book “May I Hebb Your Attention Pliss” which will be sent to the winner once it is published. Note: Very important. The prizes will be delivered by Harper Collins ONLY to addresses within India. If you are outside India, you would need to provide them with an Indian address. And yes this is a shameless promotion stunt. I have a book to sell. So bear with me please. My favorite Hindi movie quotes. For the tag you do not need to put the explanations i.e. in what is in the s—just the lines. 6. I watched a snail crawl along the edge of a straight razor. That’s my dream; that’s my nightmare. Crawling, slithering, along the edge of a straight razor… and surviving ((Apocalypse Now (1979)). Ho hum ! Get over it, Arnab. First up, best f luck for the book. woud love to know why such a distinction between hindi movies and english movies? I would have taken part in this contest but the prize(s) are being sent only to India. @GB – r u brave enough 2 have a “so bad its good” segment 4 english movies ?? 🙂 movies like battlefield earth, robot monster, catwoman, Friedberg/Seltzer movies or hilton/lohan movies ?? you never reach out for the awesome english movies. jason biggs, adam sandler, sab log ruke hue hai. i am too intellectual to consider hindi movie lines any good. i am real ‘bodhdha’ to pick great lines from great english movies. Pingback: MIHYAP Contest 1 « Words Fail Me….. I was hoping to find the Afridi-eating-ball post here! Does not qualify as film quote but Afridi’s “I was trying to smell the ball” surely breaks into your top 10. Done…couldnt resist overshooting the required 10. He watches Gunda and Loha, and Clockwork Orange too. Or at least googles for their lines – the english ones that is. Good work. Do check out my entry for the contest. i will not be counting my butter chickens before they roost and will wait before sending a postal addy for India. Firstly, Wish you all the very best for your book !!! Can’t wait to get my hands on one. So I take it that your book is not available for sale outside India at the moment ?? My Facebook friends are my only blog readers, so I’ll post a link there. We have no branch. Link to FB. 4. Teja Main Hun, Mark Idhar Hai !!! Haan to usko bol ke moonh idhar ghumaye. Didnt really expect this marketing gimmick from you in form of this contest. You are growing and may God take you to places you want to be,but dont give up on your originality. To me ( I can say most of your followers) you stand alone and spearate from the rest of the world coz of your bold writing and who you are. This whole marketing scheme you have devised brings you down to be one of those bloggers searching for success. Your book will do great just like that, believe me when I say this. Dont be “one” of “them”. Hey GB..am a big fan of urs…and books too..
so plss let me know when the book is on Sale…in India…. Don’t forget to comment if you like those. PLease comment if you like it as most of the dialogs are relatively newer…. could come up with only top 5 as i’m in middle of my end terms !!!! Here’s my list and I seek your attention pliss…. This movie was perhaps made for Shotgun and Jaani to keep hamming without any interruption. Hi GB. I was extremely disappointed to not find the book anywhere in Pune. I am eagerly waiting for it to be available in any bookstore here. Any clues from you? The book hasnt gone on sale yet !!! Please wait till beginning of March for it to be available everywhere. but I don’t want a free copy, I would like to pay for it. On condition that it needs to be autographed by the author. And I am in US. Sounds cheesy, but if I get signed copy from someone who gives such a cool perspective to the thoughts of my generation, I think it is ok to pay for it. In case someone thinks this is a scam from mr. greatbong himself, I can not prove it easily, because, I am not on facebook or any other sites. Nor do I want to be for any reason. (yeh meri bhishm pratigya hai!). 8. Yeh Dandaa dekhaa hai, andar kar dungaa! 7. Chhod de Kamine! Chhod de Mujhe! 6. Kripya Jaraa Dhire Mariye! 4. Mere man to bhaayaa, maine kattaa kat khayaa! 3. Kamaal kaa aadami hai yaar tum bhi! Ek, Ek aur pappi lene do, please! 1. Utpal Dutt: To kaho! Main baagwaali kothi ki taraf munh kar ke pishab tak nahi karoonga! Shatrughan: Main baagwali kothi ki taraf munh karake …Umph.. nahi karoonga! Hey! Humaraa south kaa majaa udaataa hai! Abhi Dekho! Main tumko lungi uthaake, Disco Nariyal Dikhaayega! Apurbo, Whether the book will ship to US, I am not sure yet. Autographed copies will be available in India, if people want. Have mercy on your US based supporters. I wish I could work out the logistics for all US based admirers. But I am going to run away and hide from such a noble gesture. One way would be if there is any internet site where I can buy this book to be shipped to US, I wouldn’t mind spending extra two way postage to send it to your mailbox or real address where you can sign it and ship it back at no cost. You have my email address. Pls do let me know. BTW congratulations on being a published writer. After half hearted attempts over years I have learnt that writing is like an iceberg. If ten percent of the stuff one may write/create may see the eyes of others, that must be a talented writer. Now.. in your post you pick hindi movies that are trash, and english movies that are classics. Why is this? A case of “naak unchu” as bongs say? Hmm? Sid, Patience sir. Want to see some more entries. Yes shameless promoter here. What to do? Book to sell. Pliss to bear. Pingback: MIHYAP – The contest « Bakwaas Baatein. Here is my entry GreatBong. Oye spam me gayi kya.. please check great bong thanks, congratulations and best wishes. Did we have to name the post after the contest? No you dont need to. Not a problem. Here is a link to my entry on my blog. http://aninosaintlife.wordpress.com/2010/03/11/the-great-movie-tag/ there’s already a pingback i guess.